Ok, before I start this blog, it won’t be for every business. I think it’ll be relevant to some small business owners and it’s something I’ve been doing for a while, since the demise of (free) reach on Facebook Pages. 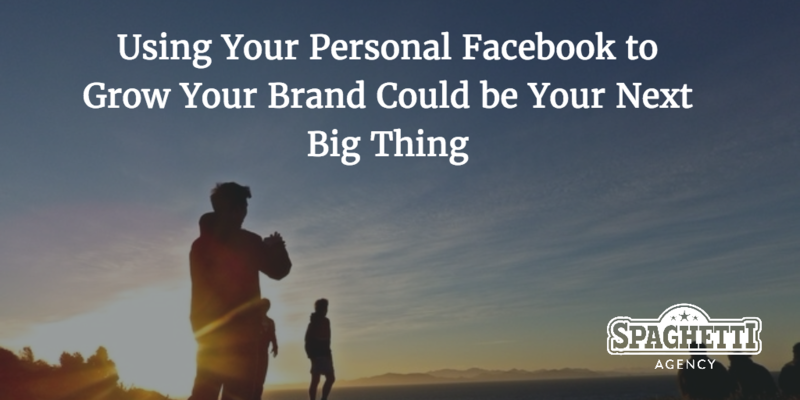 This blog comes with a warning: You shouldn’t use your personal Facebook as a business. Doing so could alert Facebook and they might shut your page down. (I know of someone who nearly had this done to them). Here’s Facebook’s official take on it. So, warnings and disclaimers out the way… let’s get into how I use my personal Facebook to grow my business and share my brand. Your business, I mean. Business is all about you and branding is too. Building a personal brand is a powerful way to grow your business. People do business with people and that’s something I’ve been working on since 2009. It’s so true and something that makes social media for you (as well as your business) so important. In the same way it happens when you go networking, your social media followers, friends and connections will get to know you before they ask about your job or business. So I like to make sure that they really know me. I turned off all the privacy settings on my Facebook! Yes… I did the opposite of what most users do on Facebook, and actually allowed people see more. I also looked at how I viewed my Facebook. Not how I viewed it on my device, but how I saw Facebook as a tool. I used to see Facebook content as stuff I only shared with family and friends; not with business contacts or people I met out networking – they were banished to my Twitter, or occasional LinkedIn updates! But think about it: People do business with people. They have to know, like and trust you, and I was hiding all the relationship building stuff on my personal Facebook. So now? Now I friend request everyone that I meet and add them to my Facebook. If I network with someone, I add them to Facebook. If I meet someone at an event, I add them to Facebook. If I train someone or get a new client, I add them to Facebook as well! I add people to my Facebook just like I used to with LinkedIn or Twitter! Of course… this means that I don’t share stupid stuff on my Facebook. Well, actually sometimes I do, but then that’s all part of me and my personal brand so it’s OK (for me). Anything that goes out online should be good enough to post on my blog, my LinkedIn or send to a potential client – because most social media has the potential to be seen by them anyway! So now my Facebook is mostly open to the public (you can view my posts without being a friend) and I also add people that I haven’t known for very long. I do not spend all day long posting about my business! I post about the things I’m doing, learning, and teaching. And I share content that’s valuable to people, content that helps them, and content that inspires or entertains them. Hello Cowboy! Hope all is good down on the ranch. I wanted to let you know that after admiring you taking the leap and wishing I could do it… I’ve bloody gone and done it! I’m leaving <name of company> to go freelance. Not only do they call me ‘Cowboy’ (how on brand is that?) but they’ve quit their job, taking into account all the content I’ve shared about being my own boss and running my own business with Jo. The reason I got that message and many others like it (about all types of stuff) is that my friends on Facebook follow what I do and genuinely take an interest in it. And then (and this is the important part of social media) when they’re ready… they do something about it. Now, this might not always be a sale, but I’ve had more business from my personal Facebook than our Facebook Page this year and that includes advertising. By using my personal Facebook to share and engage with a wider audience and accepting that people buy into me before my business, I’ve built a Facebook profile and output that’s sharing my journey and mentioning my business at the same time. In amongst all the silly content, life stories, photos, check-ins and videos is a constant message: I run a digital marketing agency that helps small businesses to get found online. Oh… and yes sometimes I’m really REALLY obvious about it… just not all the time. But that’s not true for me. Just this week someone I’ve not seen for 19 years bought from me via Facebook messenger. Until that point they just hadn’t been ready or in the position to buy from me but this week they were… and they contacted me! People don’t like being sold to and although I use targeted ads I can’t build a proper relationship with Facebook fans without constantly advertising to them. With my friends though – I can! I also build my personal brand. The brand of me. I’m a very much part of my business and people buy into what we’re doing. I know this because they tell me. They tell me they came to our workshops or wanted to work with us because they liked what we’re all about. They’re friends with me, fans of our business, followers on Instagram and Twitter and probably watch the occasional Periscope or Snapchat too! Open up your doors. Lift the lid on your Facebook and show people the real you. Make sure you share content that you want to be associated with your business and avoid ranting, complaining or having huge mud-slinging sessions… unless of course that’s part of your personal brand! Before you make this rash Facebook decision you should check on all your tagged posts and also keep an eye on what you’re tagged in. Remember that by opening up your timeline you’re allowing clients and potential clients to see what you post and what you did post years ago! There’s no hiding. You can of course decide per post which one are public with the privacy setting on each status update… but I just make sure that anything I share is OK to be seen by the world! Facebook is the world’s largest social network and your personal page has more reach and networking opportunity than your business Page. Isn’t it time you switched your mindset for Facebook? The best storytelling opportunity lies in your personal Facebook and it’s wide open for reach and fan base… just make sure it all about you and not your business, or Facebook might have something to say about it. This is such an interesting article, and was delivered to my inbox like you had read my mind! I’ve had lots of FB requests from work contacts lately and was starting to move away from ‘That’s my personal life’ towards ‘my nutty personality is a good thing’. Thanks for the confirmation! Oooh how cool is that. So you’re up for considering it? I like it. Let me know how you get on? I hear what you’re saying but I’ve shied away from going public because I’m a very private person. However, you’re right, and those of us who run a business shouldn’t feel reluctant to let the world see our personalities. I think I’ll keep my existing page private and maybe have another account that’s public for my work contacts and future prospects that doesn’t have old school friends on or my mother’s best friend’s dog etc. How does that sound? Ha… ok 🙂 Or, you could save your friends as close friends and then post private stuff to just them (you can select it from the post each time) But as I said in the blog… if it goes on the internet… potentially anyone ‘could’ see it! I read about a week ago somewhere that in Japan they use Facebook much more thank linkedin because in their culture it’s about getting to know a business partner, connection or whatever as not just their wok history and achievements but about the whole person and family. Rhys, this is such a great comment. You’re already seeing great benefits from using your personal brand and you’re right about the different use in Japan. They’re a forward thinking country! Dot on, Todd. I’ve been doing this for a while & encouraging people to do the same in coaching sessions & workshops. The amount of fear around social media is still bonkers! It’s largely common sense. That said, I do generate good business through my pages too & I’m pleased with the reach – particularly since winning that coveted blue tick. Granted, there’s more leg work to do with pages now – more sharing, targeting & storytelling needed to get the posts out there & going viral, but it still works.